There's no shortage of amazing deals to be found on the used luxury car market with former six-figure luxury sedans from Europe worth less than an entry-level Camry. These cars may be a bargain but good luck servicing that twin-turbo V12 when something goes wrong. Instead, we think it would be wiser to buy a used car from Lexus. Lexus consistently ranks at the top of most reliability surveys, meaning a used one will likely be just as dependable for you as it was for the first, second, or even third previous owner. We've all heard tales of the YouTuber who purchased an LS 400 and drove it to one million miles, showing how dependable a Lexus can be. Driving one million miles wasn't easy, even for a reliable car like an LS, but if you have a bit more money to spend on your next car, you should probably look at a younger Lexus LS 460. The LS 460 is the fourth generation of the LS sedan, built from 2006 to 2017. It was preceded by the V8-powered LS 430 and succeeded by the twin-turbocharged V6 LS 500, meaning this is the last of the V8-powered LS models. Although the LS 460 was sold until 2017, we recommend the 2007 to 2012 model years. Lexus redesigned the LS 460 in 2013 with its then-new Spindle Grille design, which was accompanied on the interior by the newly debuted Remote Touch interface. We think it's best to stick with a 2012 or older model with quieter looks and a simple-to-use touchscreen interface. If you weed out the newer, edgier models from 2013 and beyond, prices for the LS 460 are very affordable. The nicest example we found was $31,595 with just 28,000 miles on the odometer. It was likely owned by a little old lady who only drove it back and forth to bingo night. Those feeling a bit more adventurous and want to service the car themselves can roll the dice on a higher mileage example for as little as $6,000 with around 200,000 miles. The LS 460 is extremely reliable but even a reliable car will need fixing over 200,000 miles. Expect to find a nice example with less than 100,000 miles for around $15,000. All LS 460 and LS 460 L models are powered by a 4.6-liter 1UR-FSE V8 producing 380 horsepower and 367 lb-ft of torque. Power goes out to rear- or all-wheel-drive through an eight-speed automatic transmission, which was actually the first eight-speed transmission ever put into production. Although not so important on such a car, 0-60 mph takes just 5.7 seconds. Lexus also offered a hybrid version called the LS 600h, which mated a 5.0-liter V8 to a hybrid drivetrain for a total of 439 hp. The LS 600h isn't quite as cheap as the LS 460 but can still be found at similar prices. Opting for the hybrid doesn't net much in terms of fuel economy. The LS 460 averages 16 mpg in the city and 24 mpg on the highway while the LS 600h achieves 20 mpg in the city and 22 mpg on the highway. Inside, the LS 460 lacks the massive screens found in today's luxury cars and instead takes a more simplistic design approach. One centrally-mounted touchscreen handles navigation, climate, and infotainment duties while physical buttons handle everything else. Some modern cars can cause sensory overload, so it's nice to step back in time to a moment when cars were still simple. As you'd expect of Lexus, the materials in the LS 460 are excellent and will stand the test of time. Compared to the hard leather found in most brand-new luxury cars, we actually prefer the supple, non-bolstered seats found in the LS 460. 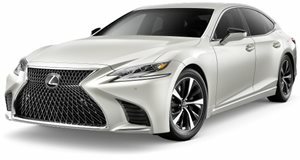 Lexus offered the LS 460 in standard and long wheelbase versions, the latter of which offers a bit more room in the rear seats. Overall length in the LS 460 L increases to 202.8 inches from 198.0 inches in the standard car, which bumps rear seat leg room from 35.8 inches in the standard car to 37.6 inches in the 460 L. For an added cost, owners could also opt for a reclining rear seat with a built-in massage function. In either wheelbase, trunk space is 18 cubic feet. You'd be hard pressed to find a new car with the same level of luxury as the LS 460 for less than around $80,000. For a fraction of that, you can have one of the most comfortable cars ever built with the knowledge that it was built by Lexus, makers of the some of the most reliable cars in history.